To bring this thread back to life, has any further work been done on this? Is a custom made gas plug for suppressor use the way to go? Venting into baffled handguards looks promising also! I have been reading this thread with great interest, and have a question on the ammo that will be used in the application. Is the solution sought for FALs using standard issue ammo or for subsonic ammo? I don't think subsonic ammo was in play. I'm not a rocket surgeon , but the reduced load of subsonic ammo , would certainly play a role in gas port apertures. How about expanding the volume in the gas plug by reducing the wall thickness, it would reduced the pressure/velocity of the gas, and less pressure to vent out and less speed of the gases venting is certainly quieter. My 0.50 of a cent worth since times are tough. Suppressing a FAL - any problems to be aware of? I'm looking to order a YHM Phantom to put on my FAL in the next week or so. Is this usually no problem to do? Are they problems with the gas system that may crop of and what are the likely fixes? i have a YHM phantom on the way, its mainly going to be riding on the AR in 300blackout, but i am planning on adding a QD hider to the FAL too. Just a cursory glance at those threads makes me reconsider doing this at all. I'm not a machinist and I didn't stay at a Holiday Inn Express last night. I may be in over my head. I was hoping to just have to thread the barrel install the Phantom Flash Hider QD and be done with it. hey! don't throw in the towel just yet. you *may* be ok just by opening your gas all the way, at least to start with. maybe see if someone will convert a gas plug for you. i'm going to ask around myself since i don't weld. it'd be simple, a standard gas plug for shooting unsuppressed, and one that you can switch out when you use the can. The plug mod is simple and I would be glad to do it for anyone here on the files. DSA 16 inch barrel + Gemtech HVT QD mount = gas not open all the way, functions great. DSA 21 inch barrel + Gemtech HVT QD mount = gas not open all the way, functions great. For me with that can and those rifle combinations, it was not that big of an issue. I just open the gas a bit and they work great. How about making this and the 3 threads noted inside into a 'condensed' Sticky? Lots of great detail and tech, along with emperical data[stuff what works] Thoughts? since i'm, not a mod in this forum (yet), i asked someone to help out because i too, think these threads should be merged and stickied. Various threads merged and then stickied as requested. some gratuitous pics, long over due for this thread. If I want to get my new 17 3/8 inch para a can, whats the best and most affordable QD flash hider and can combo? Looks like this is at least about a $1000 proposition. The $1k is for a gemtech setup, is there a cheaper setup thats just as good? Last edited by Thorack; March 16, 2013 at 22:30. Depending on what price your local dealer may offer, an AAC 762SD could be within that price range and is a proven winner for a lot of people. I'm sure this has been addressed but what is everyone doing for an adjustable gas system, or is one even needed on a FAL? Yes, I am too lazy to use the search function right now. I have a thread adapter for use on my inch rifle. it works but it is very violent ejection. I was wondering if there was a final consensus on the suppressed FN-FAL. 1- Does it function best with full-power or sub-sonic ammunition? 2- Is the plug mod necessary? 3 Are there any other modifications needed/recommended in order to ensure reliable feed, function and accuracy? My 11" runs ok with can and reg 308, haven't worked up subsonic loads yet. I am still very interested in modified gas plug because I still have to open it up a lot to keep it from slamming. I just tried my DSA short gas FAL with my YHM Ti 7.62 suppressor and with the gas port full open, lots of gas bleeding out the ejection port. Recoil seems harsher than normal. I'm a lefty, which exacerbates the situation. I'm interested in the custom gas plug and wonder if anyone sells or modifies one? Send me a spare, yes SPARE, plug and I will mod it for free. Thank You, stimpsonjcat, for your very generous offer. I sent you a PM. Last edited by smokingun45; March 08, 2014 at 08:34. All recently modded plugs are outbound. I would appreciate feedback on these if possible. Here in the thread or via PM. Stimpy, is this something you are still willing to do? I finally decided to try out my 308 can on my FAL. Yep, send me a spare plug...I'll weld it...grind it...drill it, and send it back...no charge. Again, for clarity, the modded plug will NOT allow a FAL to cycle WITHOUT the can installed. So you need 2 plugs, one modded, and one un-modded. Got mine back today. I will try it out tomorrow morning with my YHM Ti 7.62 and report back. Thank You stimpsonjcat! The moded gas plug worked fine with Port ammo. It felt like a normal recoil impulse and a lot less gas & crap from the ejection port. I needed to polish one small high spot with a Cratex wheel to fit my gas block. Just got an 18" inch barrel and acquired a para lower. The guy I got the lower from had issues shooting suppressed with it. I'm not sure what gas setting he had or barrel length. I'm planning on getting an AAC can for a black out build so I may as well spin on some AAC FHs on a couple .308s I have. Anybody run this set up with an FAL and have any issues or tips for me to try before I spend the $? Just found out bbl length was 18" and ammo used was DAG, SA and R.G. Last edited by Dirt1042; April 10, 2014 at 17:54. Hmmm...I'll check my test block. Might just make a test tube to slide them into...have to look up the spec ID on the gas block I reckon. Glad to see another satisfied user! What is your cyclone threaded for? 5/8x24 like mine? Yes, 5/8X24. Its very heavy, Ill probably have a huge impact shift ! click over your scope / target sights. What a classic thread....we have ggiilliiee, Shlomo and Gunplumber all posting in civilized fashion, along with scintillating info on silencers....why don't we have someone here on the files making a Fal Specific silencer set up for sale with appropriate gas plug items included in purchase. What a niche market that would be. Thanks artful, for the links. I had already spoken to them, the rub is, theyre not 9/16X24 LH, theyre RH. I called the manufac. (Precision) and spoke to the owner, he said they had no plans to make the LH pitch. Doesnt matter anyway, cant get that long, thin hider off ! Gotta keep trying. Do you have an adapter ? If so, whered you get it ! I do have an adapter - I've had it a long time - it was made by a machinist/hobbyist who made one for my FAL and one for My HK91 and one for my AC556 - I'm not sure the board is even around anymore - I'd just talk to a local gunsmith or machine shop - Heck I need to get motivated as I need another on made for 12x1mm ID to 1/2x28 OD for my CZ52 in 9mm. GREAT! Just made contact with a fella that has a buddy with good CNC equip. My contact just had a load dumped on him, he,s got entestine bug and his mom just past away. Will be 2-3 weeks before he comes up for air. If it turns out good, Ill let you know. Do you have specs for adapters you need ? I E-filed form 4 about 3 months ago so, I still have 1-2 months probably before my stamp comes back. after seein how lathered everyone gets about altering gas plugs, or loads, to make there guns run, it gave me an idea ! Theres a suppressor manufacturer about 60mi. from my house. if I can talk him into prototyping my idea, would you be interested in helping field-test it. if it works, now a fella can shoot his fal w/o having to alter first. Wish me luck! I'm curious to know just how much noise comes from the gas system with Stimpy's plug installed while running in semi-auto. Can anyone supply any decibel measurements at the ear for a suppressed FAL running with Stimpy's gas plug? 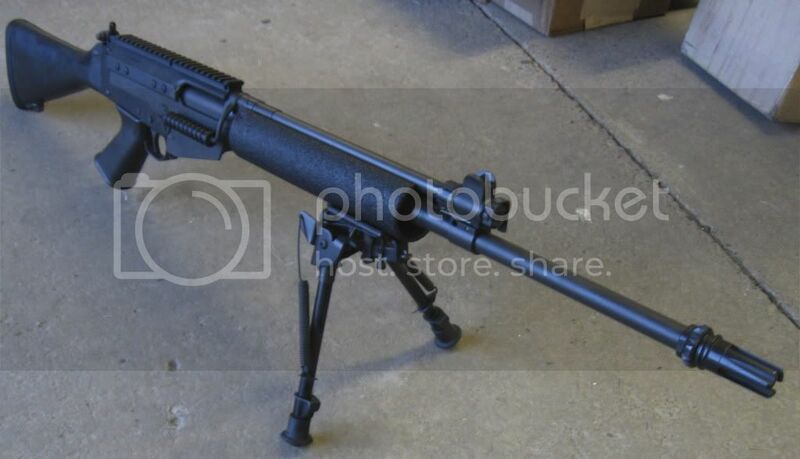 Barring that, can anyone make any noise comparisons between that setup and another, more commonly suppressed 7.62x51 rifle such as the FN SCAR or an AR-10 variant? On my select fire, it's still pretty loud with an 11" barrel and Specwar 7.62 can. Even with NO suppressor and ear plugs, I'm still ringing after one shot. In all honesty, I think the FAL platform isn't the most ideal for suppression. It works and is cool to play with, just not real effective from my experience. The modified plug is really intended to solve the overpressure problem, not necessarily to make the gun quieter. I have an idea for a gas system that would eliminate the gas vent at the gas block, but at this point it is an idea only. ANYONE SELLING the modified plug? Looking to try this setup again on my Stg58.